Posted on 01/17/2019 by Mickey McCarter	in Around Town and tagged charity, ChefsForFeds, food, government shutdown, Jose Andres, World Central Kitchen. As the federal government shutdown continues, we at Parklife DC have become increasingly outraged by the treatment of federal workers living in our city. So we urge you to donate or volunteer for Jose Andres’ World Central Kitchen to help. In DC, federal workers are our friends and neighbors, our fellow music lovers, and sometimes they are even us. Feds affected by the shutdown have gone one pay period without a paycheck, and they are approaching a month without pay in one of the country’s most expensive regions. This crisis has prompted Chef Jose Andres, a true national hero, to turn the attention of his nonprofit World Central Kitchen not to Puerto Rico or Mexico but to DC, where he set up a kitchen for federal employees at his ThinkFoodGroup test kitchen, located by the Navy Memorial, starting on Jan. 16. How can elected officials abide this? The shutdown has placed an estimated 800,000 workers out of an estimated 2.1 million federal civilian employees out of work, according to Governing. This number represents about 38 percent of the federal workers. Of those 800,000, an estimated 102,183 live in the District of Columbia; 34,344 live in Virginia; and 28,266 live in Maryland. So, Jose potentially could feed up to 164,793 folks with his charity effort, called #ChefsForFeds. How can anyone who employs these people call themselves their manager, let alone their leader in the face of such a preposterous situation? Would you justify it in the name of security? Merits of funding arguments aside, anyone strong on security would not stand for leaving the American security enterprise unfunded. The US Department of Homeland Security itself is one of the agencies left with no money in the current budget standoff. According to Governing, about 32,000 Homeland Security and Justice department employees are stationed in DC. In Virginia, about 9,000 unpaid federal workers are employed with TSA, FEMA, and other DHS agencies. To think: tens of thousands of local, hardworking people charged with keeping us safe may need food because their employer is not paying them — food they otherwise might not receive without Jose and other sources of relief like Capital Food Bank. These particular workers continue to work as “essential personnel” but without pay. That alone should be more than enough outrage to take action on this issue. In Washington, DC, the single largest employer is the federal government. By and large, federal employees came here to do something noble and to make the world a better place. And here they are, thankless and abandoned by a system that was supposed to enable their dreams and embolden our own ambitions. 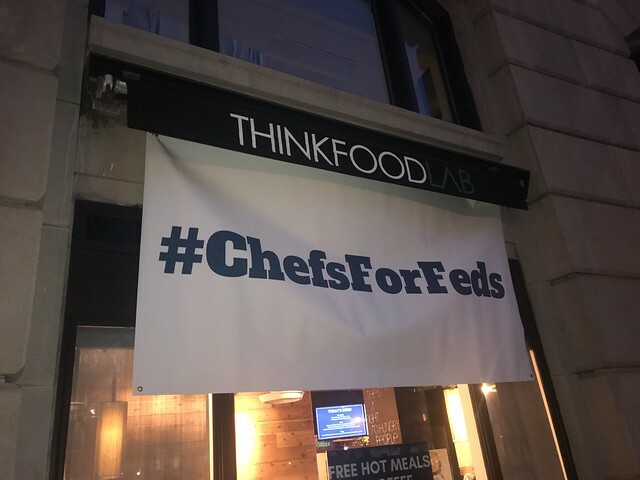 Donate to World Central Kitchen to help #ChefsForFeds. To volunteer in the charity kitchen for federal workers, email chefsforfeds@worldcentralkitchen.org. The author is a security expert who served in the US Navy, reported on the fledging US homeland security enterprise for more than a decade, and worked several years as the communications officer for the nation’s top trade association for physical security.